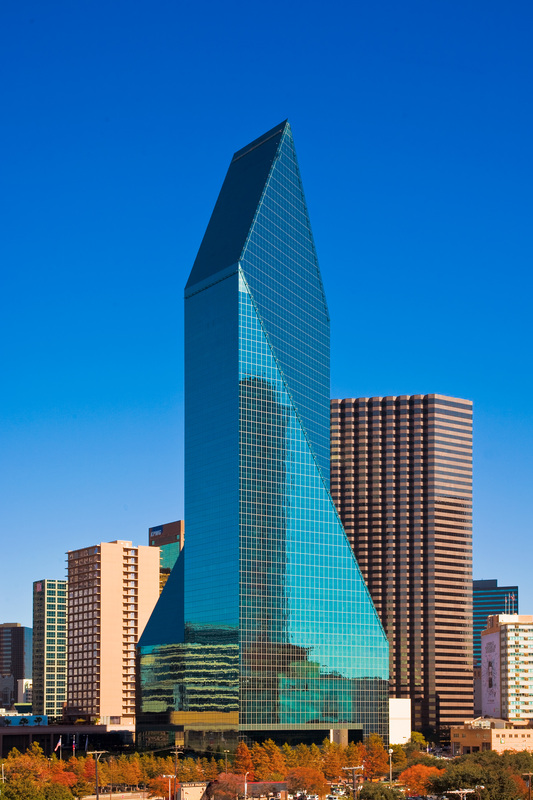 The 60-story Fountain Place in downtown Dallas. DALLAS – After more than three decades, an iconic building in Dallas is reinventing itself — and its success could have valuable lessons for commercial property owners and developers throughout Texas. Atlanta-based owner Goddard Investment Group is spending $70 million to renovate the 60-story Fountain Place, a signature part of the city’s skyline with its green glass “rocket” design. Originally known as Allied Bank Tower, the 1.2 million-square-foot building was designed by Harry Cobb of I.M. Pei and completed in 1986. It sits on Ross Avenue in the Arts District corridor of downtown Dallas. Goddard, which purchased the building in 2014, is well underway with its renovation. Improvements include major lobby enhancements and a new 10-story garage with four plaza-level restaurants at the base. In addition, AMLI Residential is developing an adjacent 45-story, luxury multifamily high-rise. The new garage will open in October and the residential tower will open in 2019. Goddard is removing the mezzanine level inside Fountain Place, which will vault the ceiling to 30 feet. The lobby will feature a floor-to-ceiling glass-wall art feature, custom designed by glass artist and designer Jamie Carpenter. He and the Austin office of Gensler are collaborating on the redesign. Already, five major office tenants have signed renewals in the structure, totaling more than 500,000 square feet: Tenet Healthcare (240,000 square feet), Wells Fargo (123,650 square feet), Hunton & Williams (87,800 square feet), Bracewell LLP (40,000 square feet) and Gerald Ray (11,500 square feet). The lesson for others in Fountain Place’s remake? Buildings that make only modest, superficial improvements, usually don’t win more tenants, push rental rates, or become differentiated in the market, Johnson says. In contrast, property owners who decide to substantially renovate or reinvent their buildings not only better stabilize their existing tenant base but are able to increase lease rates and capture their fair share of new tenants. Fountain Place is currently 85 percent occupied, with about 155,000 square feet available. In 2019, another 295,000 square feet will open up with the departure of the Environmental Protection Agency, which is moving deeper into the core of Dallas with a 229,000-square-foot lease in Renaissance Tower.